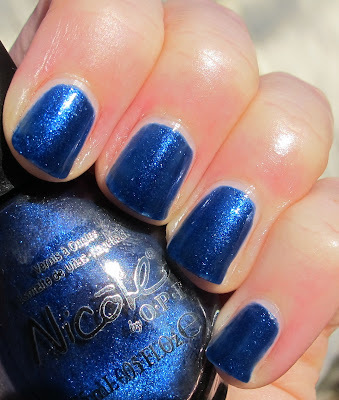 Never Enough Nails: Nicole by OPI Kardashian Kolors Part II! 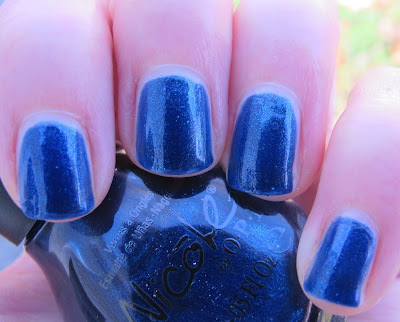 If you enjoyed the first half of this collection yesterday, I think you'll really find a few new favorites in the second half of the Nicole by OPI Kardashian Kolors. Let's get my least favorite color out of the way first. Kim-pletely In Love is a sheer pale pink with an interesting shimmer finish. This finish is kind of like a subdued glass-fleck. In some lights, the iridescent flecks look a little blue, which is cool. 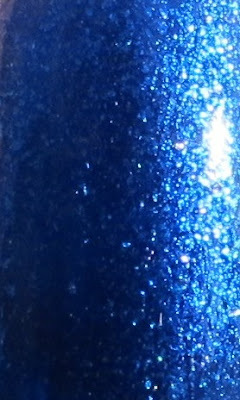 However, most of the time, the shimmer just looks like small glass flecks in the polish. 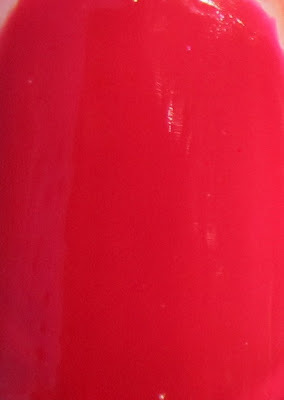 This is four coats of Kim-pletely In Love, hence why it's my least favorite polish in this collection. I'm sure it was intended to be sheer, it's just not something I would really wear. If you like French manicures, I bet this would make a really lovely sheer pink for a French. 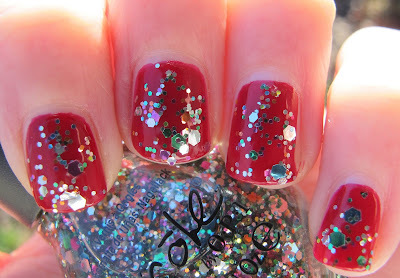 The tiny glass-fleck shimmer would be a cool look with a French. The formula was great, this applied evenly and not streaky. If you like sheer pinks, this is a good one. I just don't really wear them myself. Next up is It's All About The Glam, a sparkling white with the same tiny glass-fleck finish as Kim-pletely In Love. It's All About The Glam reminds me of freshly fallen snow at night. It actually kind of made me excited for the first big snow storm (until I have to shovel LOL). I think the above picture really shows off this tiny glass-fleck formula. It's very pretty!!! 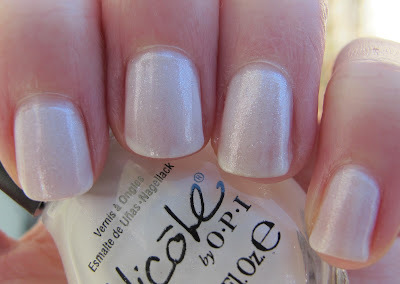 It's All About The Glam needed three coats to be opaque, but it's a relatively streak-free white. Those are pretty hard to find, so if you're in the market for a non-streak, easy to apply white polish, check this one out. My Empire... My Rules is a nice milk chocolate taupe creme. We've been seeing a lot of taupe cremes this fall, but this might be my favorite variation. It's undertones are pretty neutral, so I think it will flatter the most skin tones. It's very smooth-looking and not too gray or green. Overall, a very nice taupe creme. My Empire... My Rules did take three coats to be even though, and I felt like it shouldn't have needed the third coat. It was just a tad streaky on the sides. The formula was nice otherwise, as has been the case for this whole collection. Ahhh!!!! This one is my favorite, I think of this whole collection!! Follow Me On Glitter didn't look like much in the promo pictures, but it's soooooo cool! 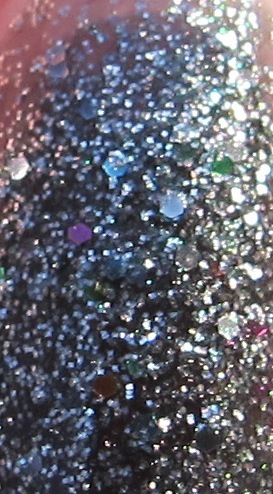 This gem is a graphite gray/black jelly base filled with small graphite glitter pieces and larger holo hex glitter. 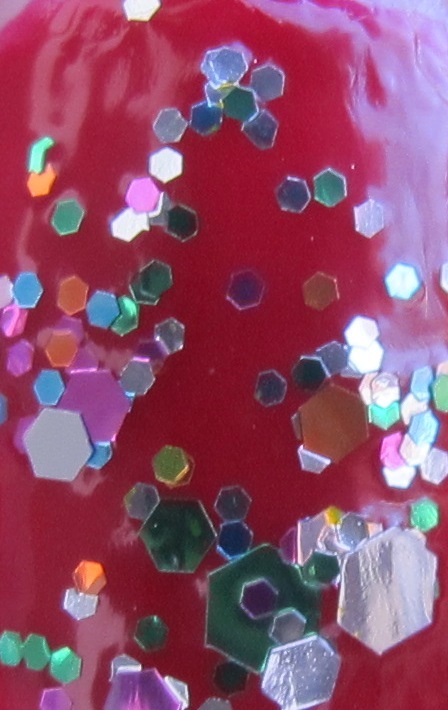 The effect of the holo hex glitter randomly strewn about in all of the gunmetal color is really awesome. Love this one! This was three coats, but it was worth it! If I had been more careful, I probably could have done just two coats. 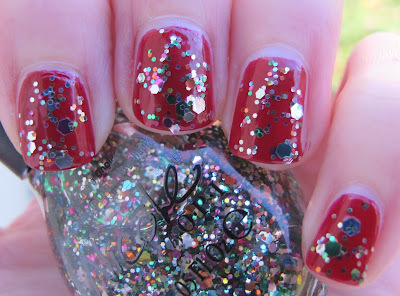 Follow Me On Glitter dried a little bumpy, but it smoothed out pretty well with one coat of top coat. Listen To Your Momager! is a really beautiful pool blue shimmer. 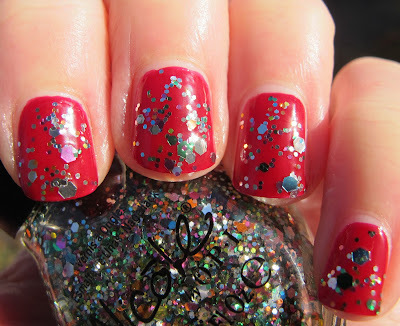 I love colors like this, and this one is very pretty and shimmery. It reminds me of something, but I couldn't find whatever polish I was thinking of. Any suggestions? 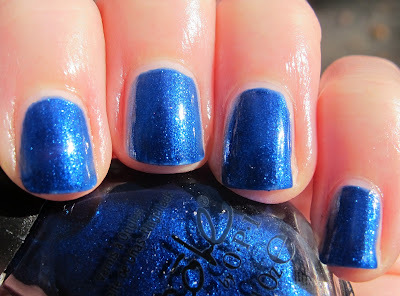 Either way, I do love this color and the gorgeous shimmer is heavily packed in there. Luckily I had sun to photograph this one! This was two coats, girls with longer nails might want to slap on a third coat. Nice formula again, no complaints! I'll be wearing Listen To Your Momager! really soon. Maybe on my toes!! 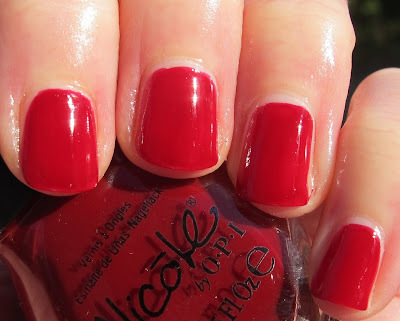 Sealed With a Kris is a pretty red creme with a squishy texture. It's not translucent enough to be a jelly, but it's squishy nonetheless. Sealed With a Kris has a berry/pink undertone and was really flattering on me. Despite the fact that I own 9 gazillion reds, I really love this one and Kourt Is Red-y For A Pedi for some reason. I think it's the squishyness. Either of these two reds would make an excellent addition to your collection. Go with Sealed With a Kris if you have cool-toned skin. 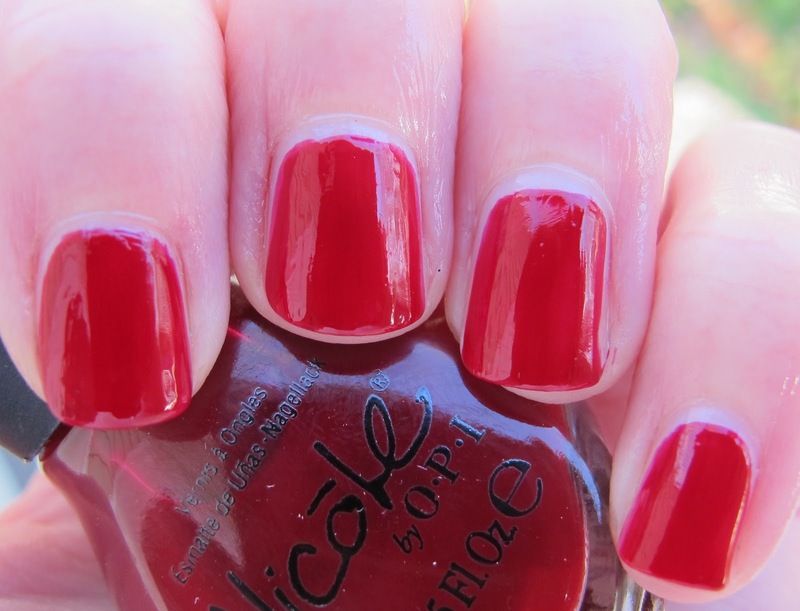 This was perfect in two coats, and flawless to apply. It looks really holiday-ish and bright to me! Festive. I was originally really excited for Rainbow in the S-Kylie, but I think I prefer OPI Rainbow Connection. Rainbow in the S-Kylie is a multi-colored glitter polish with all different shapes, sizes and colors of glitter. It has medium-sized round glitter and both medium and large hex glitter. In comparison to OPI Rainbow Connection, I think Rainbow in the S-Kylie has more medium-sized glitter and less large hex glitter. I will do a direct comparison in a few days. 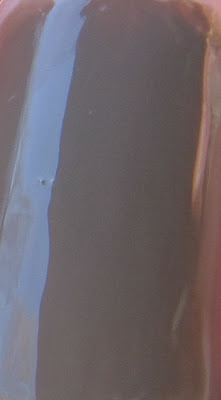 I did two coats of Rainbow in the S-Kylie over Sealed With a Kris. I am not sure if four coats or so would build up to full opacity, but I will give it a try when I do the comparison with OPI Rainbow Connection. I really love polishes like this and will absolutely wear it a lot, I just think I like Rainbow Connection more!! 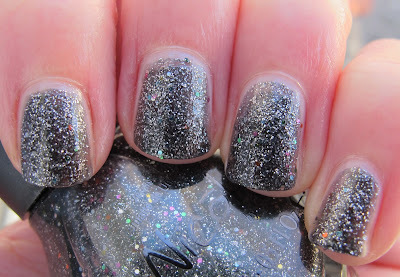 One comment about the Kardashian Kolors as a whole, they dried really quickly!!! I was really impressed with the drying time on almost all of these, except for All About The Glam, which took a bit longer than the others. My personal Must Haves from this collection are Follow Me On Glitter, Khloe Had a Little Lam-Lam and Kendall On the Katwalk. I do think there are some great choices for everyone in this collection. If you want a nice new white, definitely get All About The Glam. Kourt Is Red-y For a Pedi is a flawless coral red jelly, so I would definitely recommend that, and there are pretty neutrals too! 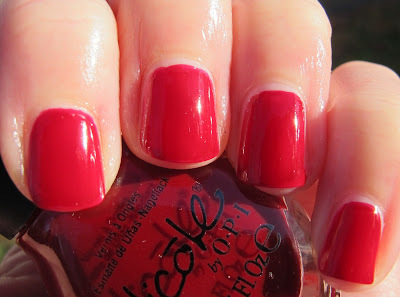 Let me know if you want to see any other comparisons besides OPI RC and NOPI Rainbow in the S-Kylie.